The PXSe is an Ethernet to synchronous adaptor or gateway. Connected directly to a computer's Ethernet port or indirectly through an Ethernet switch, the PXSe can provide synchronous communication just as an internal synchronous adaptor does. Its true strength is to be able to operate as an autonomous gateway, tunnel, bridge, switch, RPC server or other type of communication server, including as a data line monitor. 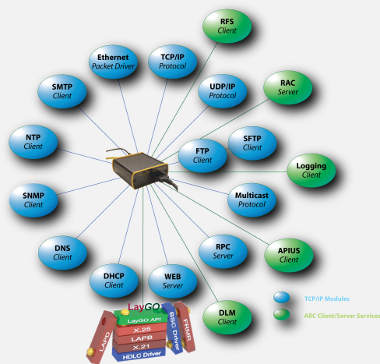 Synchronous protocols, such as LAPB, LAPD, X.25, Bisynchronous and Monosynchronous are supported through our LayGO multiprotocol host services that can operate either on the host computer or the PXSe. Nearly all PCs today come with built in Ethernet ports, and the operating systems support the full TCP/IP protocol suite. Because of the wide use of Ethernet, the PXSe is a true alternative for disappearing PCMCIA and PCI synchronous adaptors. Each Ethernet port can be converted by the PXSe to one or two synchronous ports, and exchange TCP/IP to synchronous protocol services, such as X.25, LAPB or others. These services can also be shared among multiple workstations. 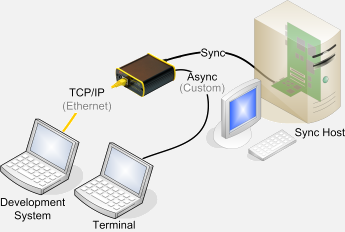 The PXSe connected to a Legacy Host's synchronous port(s) exchanges the physical connection to Ethernet, and the synchronous protocol to TCP/IP or UDP. Protocol exchange can be done on any layer, physical, link, network or higher. This exchange does not affect the legacy host system's synchronous hardware or the software. The serial port(s) can be either synchronous or asynchronous and use one or two built in high density Hirose connectors, configurable for RS-232, RS-422, RS-485 and V.35. RS-232 supports 128 kbps; RS-422/485 and V.35 support 8.192 Mbps (E2). Standard straight (male) and X-Over (female) cables are available for all common interfaces. On request, we can deliver customized cables. The PXSe supports bit synchronous and byte synchronous mode. Bit synchronous can be bit transparent or HDLC/SDLC; byte synchronous can be Bisynchronous or Monosynchronous. Data encoding can be NRZ, NRZI, FM0, FM1 or Manchester. Each PXSe port can be independently configured as DTE or DCE, RS-232, RS-422 or V.35, HDLC or Bi-Synchronous, X.25/LAPB or X.25/LAPD, etc. What about current LayGO® users? 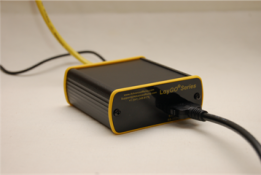 The PXSe can operate exactly as a PC with an internal synchronous adaptor by using an RPC-like interface between the LayGO® API (RPC client) and the LayGO stack running inside the PXSe (RPC server). Current users of PCI, PCMCIA, PC/104, PMC and even ISA cards need only replace the existing LayGO® API DLL. No other changes to existing applications are necessary. Since communication between RPC client and server normally uses TCP/IP/Ethernet, LayGO® applications from any LAN workstation can access the PXSe either locally (TCP/IP LAN) or remotely (TCP/IP WAN). In the latter situation, protocol delays through the network may occur. In addition to the eCos® Real Time Operating System (RTOS) and built-in TCP/IP support, the PXSe uses LayGO®, our highly modular multi-protocol stack (X.25, LAPB, LAPD, NRM, Frame Relay and proprietary). Besides HDLC, we support drivers for SDLC, bit-transparent, Bisynchronous and Monosynchronous modes. The combined use of LayGO® and TCP/IP services provides a great variety of communication solutions. 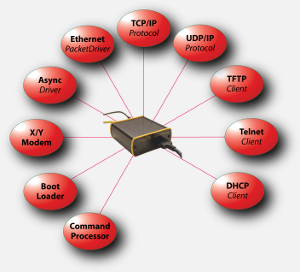 The PXSe provides a full range of remote client and server services. Web server to update or reconfigure the PXSe. RAC server (Remote Application Control) to take control of the PXSe application. Log Client to submit logging information to a remote log server. APIUS (Automatic PXSe Installation and Update Service) client to automatically install and update the PXSe software and CPLD hardware. DLM client to monitor data lines between the PXSe and the target system at the physical, link, network and application layers. 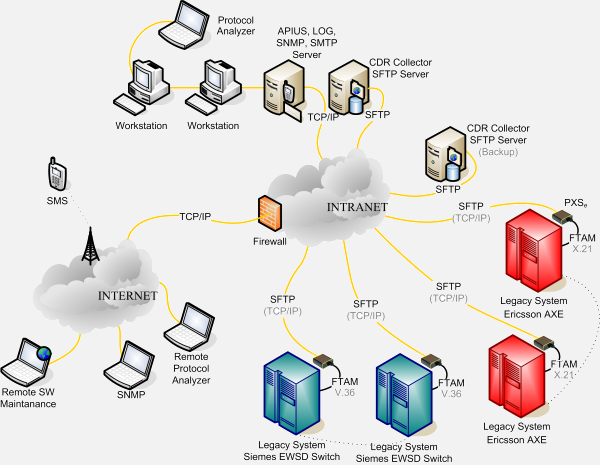 SMTP or SNMP client to send e-mail (SMS) or trap messages about potential communication problems. The PXSe is a small external device that is easy to install using an Ethernet connection. 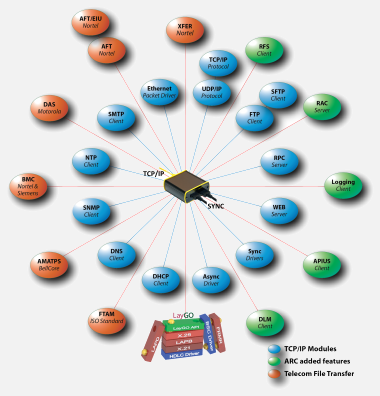 It combines the host computer with Ethernet, synchronous communication adaptor, operating system, TCP/IP protocol suite, and LayGO® multiprotocol software. LayGO® communications services can be accessed by any workstation to access, control, monitor and configure the PXSe, even if it is connected through a TCP/IP WAN. The PXSe can be remotely updated, maintained and monitored through the APIUS, the web server and the DLM tap. Since April 2008 Swisscom has used our PXSe as an FTAM/X.25-to-SFTP/TCP/IP gateway on nearly 140 Siemens EWSD and Ericsson AXE phone switches, to replace all their FTAM/X.25 ISDN BRI connections and remote gateways. Besides transferring all CDR files to two collectors (SFTP Servers), the APIUS is used to automatically install and upgrade PXSe software and configuration profiles. The LOG and DLM clients are used to log events to remotely monitor the FTAM/X25 traffic. The Swisscom installation was a complete success, and has not failed once! The most powerful use of the PXSe is as a target platform for proprietary applications or customized protocol implementations. Most LayGO® solutions in use by our customers function as gateways and use TCP/IP, UDP, FTP or SFTP (secure FTP) as part of the application. 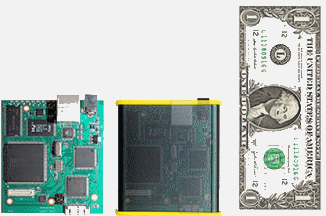 The PXSe is the ideal platform for these applications. 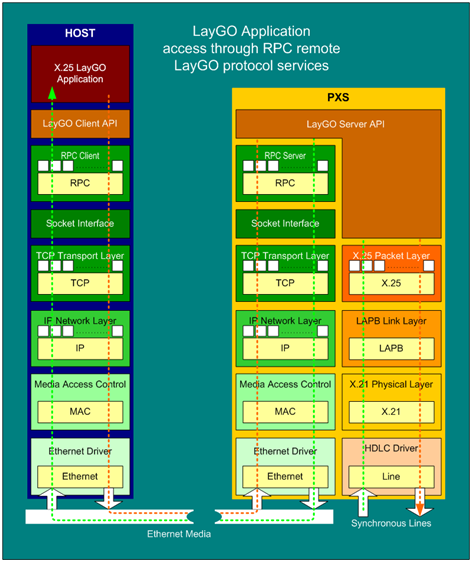 We offer developers a LayGO® toolkit to build PXSe-targeted applications. A Linux-based, cross-platform development environment for the ARM processor is available through Advanced Relay. Software development for embedded Real Time Operating Systems (RTOS) requires special expertise, particularly for eCos, a single-tasking, multi-threaded RTOS. We offer our experience and support during this development. 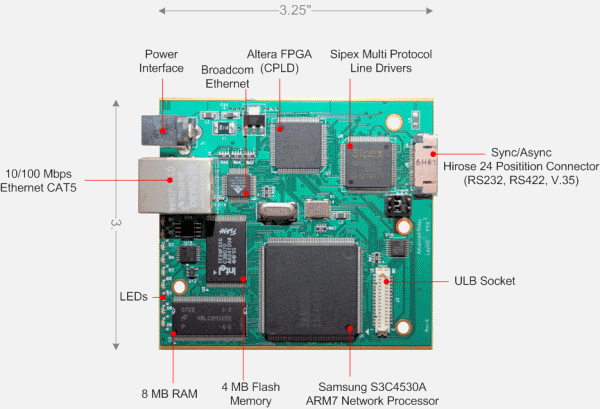 PXSe uses an integrated Samsung ARM7 network processor with memory, flash disk, one Ethernet, and one or two sharable asynchronous/synchronous serial ports. Two additional features provide needed flexibility: A CPLD (Complex Programmable Logical Device) allows hardware customization and a Universal LayGO Bus (ULB) socket interface allows the design and use of a wide range of ULB daughter cards. Through a daughter card, a second serial asynchronous/synchronous port is supported. Via the CPLD, the serial ports are configurable for synchronous or asynchronous modes. Both modes support RS-232, RS-422 and V.35 signaling. RS-232 supports up to 128 kbps and RS-422/V.35 supports up to 8.192 Mbps or E2 (4x E1). The Ethernet port auto-detects 10 or 100 Mbps and direct or crossover connection (MDI/X). The PXSe uses a 100/240 VAC 60/50 Hz switching power supply. When powered on, the PXSe executes a Power-On Self-Test (POST), then loads and executes a version of the RedBoot bootstrap environment. If no RedBoot commands are issued during a configurable time-out interval (default 15 seconds), RedBoot loads and executes the LayGO® server application. The 4 MB Flash Memory is organized as a non-hierarchical disk containing 64 x 64 KB sectors. The first three sectors are protected and contain RedBoot and its loader, the last two sectors contain the Flash Image System (FIS) directory and configuration data. RedBoot includes basic terminal, TCP/IP, and TFTP support. The PXSe flash memory contains a LayGO® server application statically linked to eCos, a multithreaded RTOS (Real Time Operating System). eCos includes a complete TCP/IP stack and support for HTTP, DHCP, FTP, DNS, SMTP, SNMP, and NTP. The figure to the right shows all the components of a typical LayGO® application. Hold the mouse over the balloons to see the explanations. At the physical layer, the primary use of the PXSe is to switch synchronous and Ethernet data. In addition, switching can be synchronous ↔synchronous, synchronous↔asynchronous, and Ethernet↔asynchronous. At the Ethernet level, the primary higher protocol is TCP/IP, although it is possible to use the raw mode Ethernet Packet Mode as well. The synchronous ports can be either bit-synchronous (transparent or raw mode HDLC/SDLC) or byte synchronous (Bisynchronous or Monosynchronous). In bit-synchronous HDLC/SDLC mode, switching can be done on any protocol supported by LayGO®: X.21, X.21bis, HDLC/LAPB, HDLC/LAPD, Frame Relay, NRM, X.25/LAPB, X.25/LAPD, and X.25/LAPB/Frame Relay (Annex G). 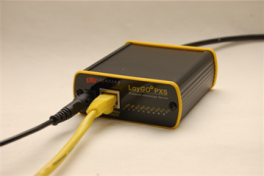 The LayGO® protocol software and applications can run either on the PXSe, on the host or on a combination of the two. We have implemented an RPC-like interface between the PXSe and the LayGO® API, allowing customers to run existing LayGO® applications unmodified, using the PXSe as a synchronous adapter. The Solutions page shows several PXSe applications.